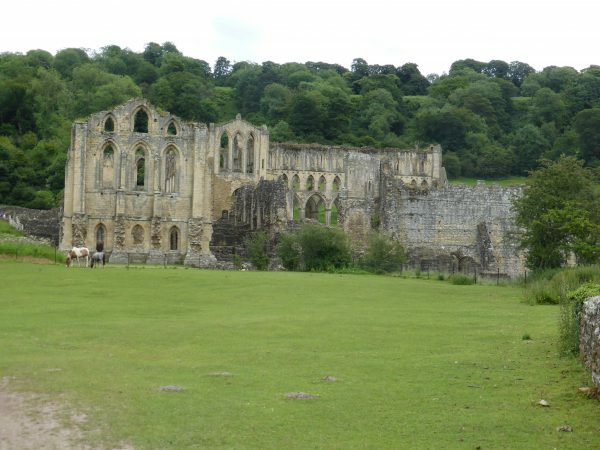 Lynnie has identified a walk in our 100 Great Walks in Britain that takes us close to Rievaulx Abbey. So we agree that this will be our destination today. Her thumb is swollen and has gone a dark shade of purple, but I am told that it is going to be okay and we do not need to visit A&E. Our trip to Rievaulx involves a drive across the moors. There is a lot of exposed moorland up here. This is not a journey you would contemplate on a snowy winters night. 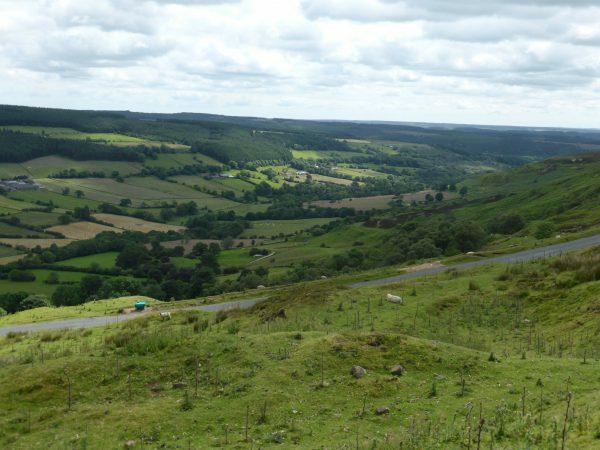 Our route takes us through the village of Rosedale Abbey and after climbing the 1:3 Rosedale Bank we arrive at Rosedale Top. Apparently this is one of the steepest roads in Britain. The road was constructed by the ironstone company that operated the Bank Top kilns. There are still remains of the iron kilns, we park up and wander across to take a closer look. The kilns used the ore from the nearby Hollis Mines. The ore was roasted to drive off water and carbonic acid, a process called calcination that reduced the ironstones weight for transportation. Yet another reminder of our industrial past. We eventually arrive at Helmsley, a pretty town on the edge of the North York Moors. We park up and as I sort out our walking route and rummage for change an over vigilant parking attendant explains that as soon as I stop I am required to purchase a ticket. I find it fascinating how these individuals engage with the public. Sometimes they are welcoming and helpful to visitors, on other occasions like today, they appear to have one aim in life, to be antagonistic. Thinking about the discussion we had the other day about dogs and owners having similar characteristics, I suspect that if this chap owns a dog it is a pit bull. We should have taken the interaction with the parking attendant as a harbinger for the rest of our day. We start our walk on a pleasant path signposted the Cleveland Way, this takes us across fields and through woodland to arrive at a road leading towards Rievaulx. 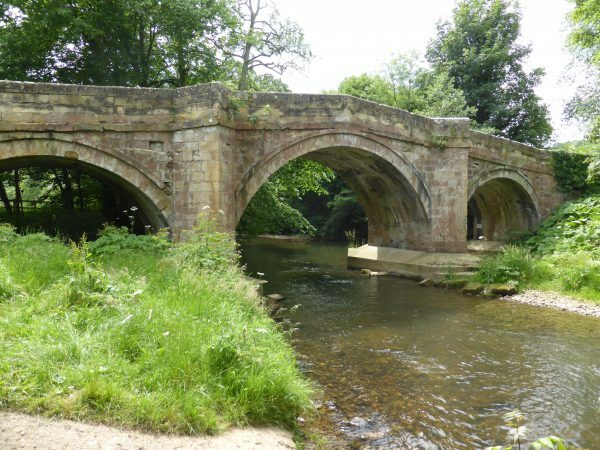 At the attractive road bridge we turn right into the village and start to get glimpses of the Abbey. Rievaulx Abbey was founded in 1132 by twelve monks from Clairvaux Abbey and was the first Cistercian Abbey in the north, Henry VIII dissolved it in 1538. 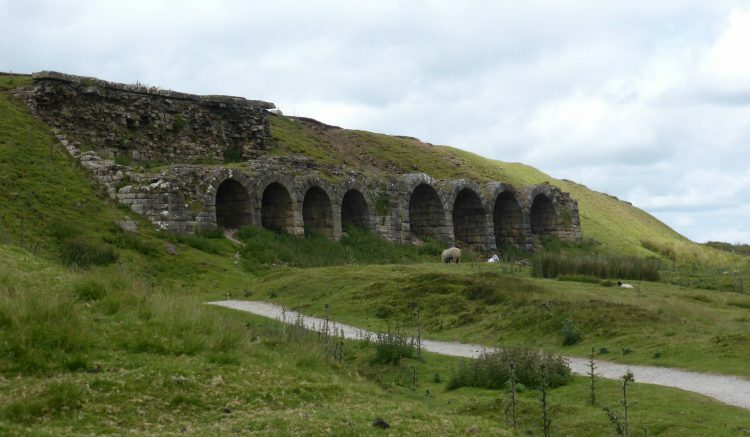 The abbey owned a prototype blast furnace at Laskill, producing cast iron as efficiently as a modern blast furnace. It is said that the closure of the abbey delayed the industrial revolution by two and half centuries. Further through the village we come to the Church of St Mary. 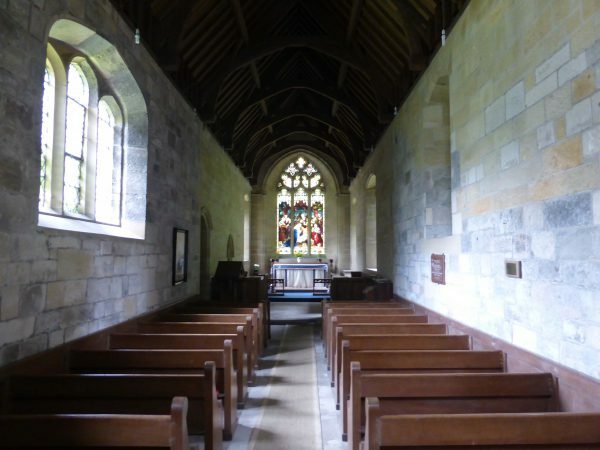 Over 800 years ago the nave of this church formed the “Gate Chapel” of Rievaulx Abbey. During the dissolution it was also surrendered and sleighted and then stood derelict for over 300 years. In 1906/07 it was restored. Today it is a tranquil little church. Our walk takes us on an uphill track directly opposite the church, ignoring tracks to our left we eventually reach open fields. On reaching a busy road (B1257) we turn left and walk along the wide verge. After about quarter of a mile we turn up the track to Oscar Farm and go through the farmyard then follow the footpath signs that take us across a couple of fields and into a plantation. At this point our walking book says that the route is faint but marked by yellow markers pinned to trees. The first part is easy it is a broad track we are then instructed to turn right and soon join the marked path on the left. We do. This path has yellow markers, it also appears to be used by motor bikes. The route loops through trees and back on itself. We appear to be following a bike route and not the footpath. We check the map and work out where we are and then start off again. We spy another marker in the distance and follow this down on what is initially a clear path, but soon becomes dark, overgrown and less distinct. We know where we are, in Dark Gill, our map shows a path running through the bottom of the gill. The path is thick with nettles, not an ideal route for a chap in shorts! I get stung, swear a bit and get stung again. This is not a great walk! Eventually after twenty minutes of difficult walking we emerge onto a broad track. Time to apply the sting cream. We then take a track that leads us up to Ouldray Farm and follow a path across a couple of fields before entering a wood and descending into Beck Dale. Here we join the path we would have been on had we found the correct route. This takes us back into Helmsley. 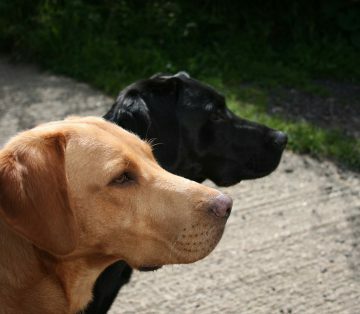 It has been a walk of about ten miles and is definitely the least favourite of all our walks. 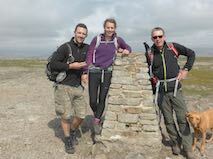 We decide that to make up for it we will pop in to the local pub in Lealholm for a meal. The Board Inn is a cracking pub. When we called in on Monday evening we were shown a blackboard menu and I had spotted loads of options. This evening the menu has totally changed, still lots of choice, but a clear indication of an ever changing menu. The Black Sheep is probably the best pint I have encountered on my travels and the meal is excellent. A cracking evening that has made up for a disappointing walk.